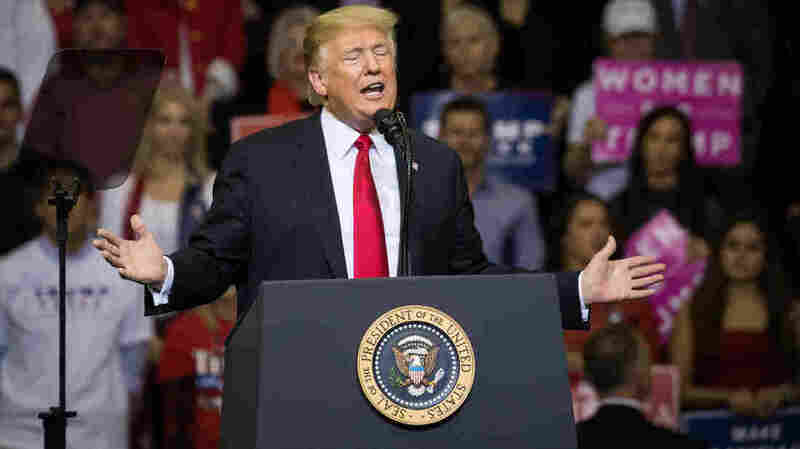 FACT CHECK: President Trump's False Claims On Migrant Caravan, Tax Cuts President Trump has been keeping fact-checkers busy with his campaign claims of Middle Eastern migrants and a 10 percent middle-class tax cut. President Trump addresses the crowd during a rally in support of Sen. Ted Cruz, R-Texas, on Monday in Houston. Here's a look at some of the the president's latest false claims. "Criminals and unknown Middle Easterners are mixed in," Trump tweeted on Monday. Later, he repeated that unsubstantiated claim, telling White House reporters "you're going to find MS-13, you're going to find Middle Eastern. You're going to find everything. And guess what? We're not allowing them in our country. We want safety." Reporters traveling with the caravan and the migrants themselves say they haven't seen any Middle Easterners in the group. While it's not unheard of for people from the Middle East to try to cross the border illegally from Mexico, it is extremely rare. Of more than 300,000 people apprehended last year trying to cross the Southern border illegally, fewer than 100 came from countries in the Middle East, according to data gathered by Customs and Border Protection. "There's no proof of anything," Trump said. But he insisted the migrants and illegal immigration in general pose a serious threat to the country. "Certainly you have people coming up through the Southern border from the Middle East and other places that are not appropriate for our country," Trump said. "And I'm not letting them in." Trump has promised to focus on hot-button issues like illegal immigration and the Supreme Court in the homestretch of this year's campaign season. "This will be the election of the caravan, Kavanaugh, tax cuts, law and order, and common sense. That's what it is," Trump told supporters in Houston Monday night. Many mainstream Republicans thought they would be running this year on the strength of the big tax cut that Congress passed in 2017. But as time has passed, that tax cut has not worn very well. Maybe people aren't seeing a bump in their own take-home pay. Or perhaps they're worried about the federal deficit, which has ballooned as corporate tax revenues fell. Approval for the tax cut is hovering around 40 percent. "We're going to be putting in a 10 percent tax cut for middle-income families," Trump told supporters in Houston Monday. "It's going to be put in next week." Whatever you might think of the merits of another tax cut, it's not going to happen next week as the president suggested. Congress is not even in session until after the election. Moreover, no one outside the White House seems to have much of an idea of what the president is talking about. Rep. Kevin Brady, R-Texas, who heads the tax-writing committee in the House, just smiled at reporters and offered a thumbs-up in Houston. Brady later issued a statement saying, "We will continue to work with the White House and Treasury over the coming weeks to develop an additional 10 percent tax cut." Larry Kudlow, who directs the president's National Economic Council, conceded on Tuesday morning that Trump's timetable of acting next week may be overly ambitious. "It may not surface for a while, but that's his goal," Kudlow said. "That's his policy intent. And I don't see anything wrong with that." Trump — a political novice — has a history of promising quick results, then missing deadlines. The 10 percent tax cut appears to be a bit of political vaporware timed for the election and a tacit admission the actual tax cut Republicans passed last year isn't selling very well. Sen. John Cornyn, R-Texas, complained the hearings had degenerated into "mob rule," and Trump has gleefully picked up that language. "Democrats produce mobs. Republicans produce jobs," Trump told supporters on Monday. This is a distillation of the president's exaggerated complaint that Democrats favor open borders, lawlessness and Venezuelan-style socialism. While Senate Democrats almost unanimously opposed Kavanaugh's nomination, some — including the ranking Democrat on the Judiciary Committee, Dianne Feinsten — seemed as frustrated by the protesters as were their Republican counterparts. Many Democrats object to the president's get-tough border security and criminal justice policies as counterproductive. But they would reject the labels Trump tries to attach to them. Finally, while job creation during Trump's first 20 months in office has been strong, it still trails the level of job creation during former President Barack Obama's last 20 months in office.